Stereolithography (SLA) and Digital Light Processing (DLP) are two of the most popular 3D printing technologies around. 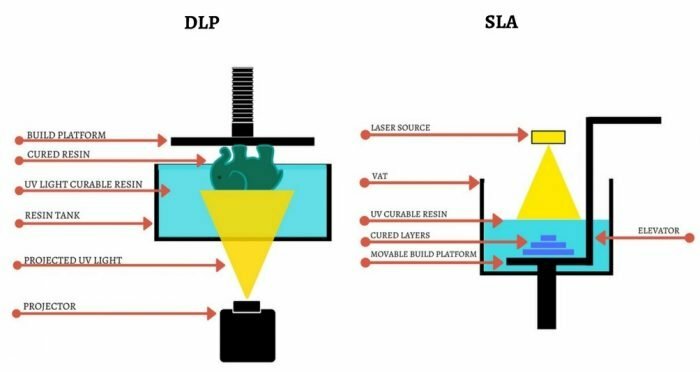 Sharing a number of similarities, both SLA and DLP fall into the vat polymerisation family of 3D printing technologies. The two technologies have undergone a huge evolution in the last decade, stepping beyond their rapid prototyping origins to production. Thanks to the high precision and excellent quality of parts produced, SLA and DLP can be used for a broad range of applications, including functional prototypes, dental products, consumer goods and even jewellery moulds. Following our previous article on the evolution of metal 3D printing, today we’re taking a deep dive into stereolithography and similar 3D printing technologies: how they’ve evolved, current applications and future opportunities. SLA and DLP both fall into the vat polymerisation category of 3D printing. Vat polymerisation is a 3D printing process that uses a light source, such as UV light, to cure (solidify) liquid photocurable resins (also known as photopolymers) to create a solid part, layer by layer. Fundamentally, both SLA and DLP use liquid resins and a light source to produce 3D-printed parts. However, a key difference between the two technologies lies in the type of light source used to solidify the material: with SLA, this is a UV light, while with DLP, a digital light projector screen is used. The SLA process starts with a 3D printer containing a tank of UV-curable resin. When a print begins, the build platform is submerged in the tank and a laser beam traces the contours of a part, solidifying the layer of liquid resin. Once the layer is complete, the build platform is lowered, making room for the next layer. DLP 3D printers work in almost an identical way to SLA systems. However, the key difference is that DLP uses a digital light projector screen to flash an image of each layer at once. Since an entire layer of resin material is exposed to the light source at once, DLP is typically a faster process than SLA. Although faster, there are tradeoffs to be made in resolution and surface finish when it comes to DLP 3D printing. This is because the digital light projector delivers light in pixels — creating volumetric pixels, or voxels, in the resin. This, in turn, results in a pixelated shape that prevents smooth edges. DLS uses a photochemical process where light is projected through an oxygen permeable membrane into a vat of UV-curable liquid resin. A programmed thermal curing bath or oven is then used to set the mechanical properties of the part in order to strengthen it. Now, that we’ve mastered the basics of vat polymerisation, let’s take a closer look at how the technology has evolved. The era of 3D printing began with stereolithography. While the origin of SLA is commonly attributed to inventor, Chuck Hall, it was Japanese researcher, Dr. Hideo Kodama, who first introduced a new approach to curing photosensitive resins with UV light in a layer-by-layer fashion. However, the term ‘stereolithography’ was coined by Hull in 1984, who successfully filed a patent for the technology. Two years later, in a bid to commercialise the technology, Hull founded 3D Systems, and the first SLA machine was released in 1987. While the history of SLA is closely associated with 3D Systems, the evolution of DLP is closely linked with another US company: EnvisionTEC. Al Siblani, EnvisionTEC’s CEO, developed the first functional DLP printer in 2000 with business partner, Alexandr Shkolnik. Two years later, EnvisionTEC brought the first DLP machine, the Perfactory 3D printer, to market. 1981: Dr. Hideo Kodama files a patent application for a rapid prototyping device, described as a laser beam resin curing system. While the device can be seen as a precursor to stereolithography, the full patent was never completed — reportedly due to a lack of funding. 1984: Chuck Hull files a patent for an “Apparatus for Production of Three-dimensional Objects by Stereolithography”. 1986: Hull goes on to found 3D Systems. 1987: 3D Systems commercialises the first SLA 3D printing system — the SLA-1 machine. 2000: EnvisionTEC’s Al Siblani and Alexandr Shkolnik develop the first functional prototype of a DLP printer. 2002: EnvisionTEC brings the Perfactory DLP 3D printer to market. 2010s: Several patents for SLA and other 3D printing technologies begin to expire, giving rise to new companies developing their own SLA systems. 2011: Formlabs enters the 3D printing market with its low-cost, professional desktop SLA 3D printer — the Form 1. 2013: Photocentric develops its Daylight Polymer Printing technology — a cheaper 3D printing technology that uses LCD screens as a light projector. 2014: Carbon unveils its Digital Light Synthesis (DLS) technology, capable of printing at high speeds and producing parts that rival the quality of injection-moulding. 2016: 3D Systems unveils the Figure 4, a modular, robotic-powered 3D printer geared towards automating the SLA 3D printing process. 2018: Adidas mass produces 3D printed midsoles for its Futurecraft 4D range of sneakers using Carbon’s DLS technology. The 2010s have been particularly fruitful when it comes to the evolution of SLA and DLP technologies. Between 2011 and 2016, several new photopolymerisation techniques emerged, pushing the limits of what is possible with 3D printing. Desktop 3D printing has historically been the preserve of FDM. However, as several patents relating to SLA began to expire towards the end of the 2000s, the potential for desktop SLA 3D printing was born. One company to take advantage of this shifting landscape was Formlabs. Formlabs was founded in 2011 with the goal of bringing lower-cost desktop SLA printers to the market. At the time, the SLA market consisted of large, expensive industrial 3D printers, inaccessible to many smaller companies. Formlabs’ desktop SLA systems have helped to change this status quo by offering machines that are not only smaller, but also more affordable. This, in turn, means these industrial machines are accessible to a wider range of companies. Taking SLA to desktop has been pivotal for Formlabs, particularly as desktop systems are increasingly finding industrial applications. Indeed, just a few years after its founding, Formlabs reached unicorn status. 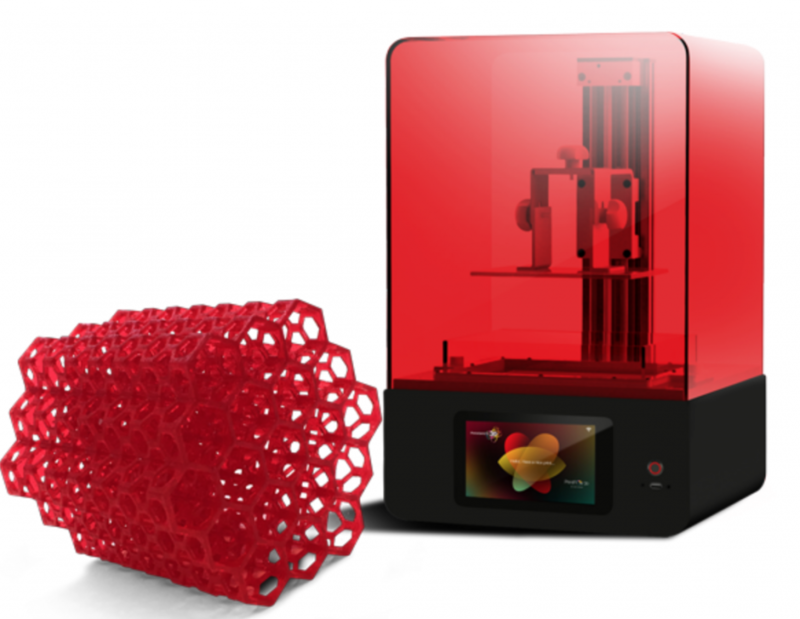 The company claims to be the world’s largest seller of SLA 3D printers, with more than 40,000 systems sold. In less than a decade, Formlabs has established itself as one of the leading companies in desktop SLA 3D printing, thanks to a combination of technological innovation and astute strategic thinking. Since its introduction to the market in 2002, DLP technology has steadily evolved to enable greater accuracy and faster printing speeds. EnvisionTEC, a leader in DLP technology, has significantly contributed to the advancements in this field. To give manufacturers the ability to print faster and produce larger parts, the company unveiled its Continuous Digital Light Manufacturing (cDLM) technology in early 2016. A twist on DLP technology, cDLM works by continuously moving the build plate along the Z axis. Compared to traditional DLP methods, cDLM can deliver faster print speeds of 20-50 mm/h, and can also produce larger parts. 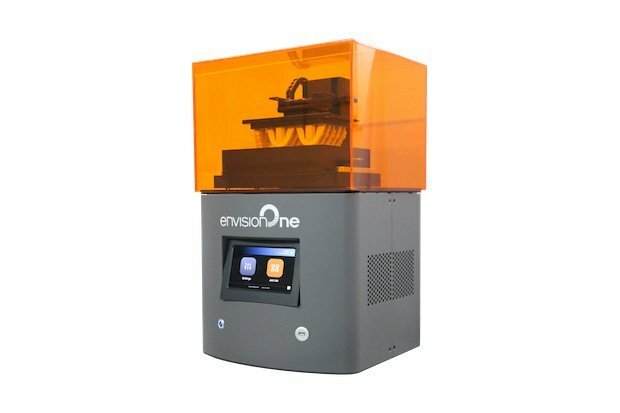 At the end of 2018, EnvisionTEC announced the release of the latest system in its line of cDLM 3D printers: the Envision One cDLM. The new line comes in two models: the Envision One cDLM Dental and the Envision One cDLM Mechanical, designed for dental and engineering applications respectively. Daylight Polymer Printing (DPP) is one of the latest developments to come to vat polymerisation 3D printing. The technology, developed by UK resin specialist, Photocentric, reimagines photopolymerisation printing by using daylight instead of ultraviolet light to harden the resin. Photocentric achieves this by equipping its 3D printers with mass-produced LCD screens. The company revealed the first daylight photopolymer 3D printer in November 2015. Since the cost of an LCD screen is only a fraction of the cost of lasers or digital light projectors, Photocentric’s 3D printers are less expensive than SLA/DLP printers, while offering the same print quality (for reference, Photocentric currently offers 3 machines, with a price point ranging between $2,300 and $4,800). Founded in 2002, Photocentric is reportedly one of the few manufacturers of photopolymer resins in the world. In addition to the cost benefit, there other advantages of DPP systems. For example, the very low light intensity generates almost no heat during the polymerisation process, making it less likely for an object to stick to the resin tank during printing. But perhaps the biggest benefit of all, DPP enables large format, high-resolution printing at a low cost. 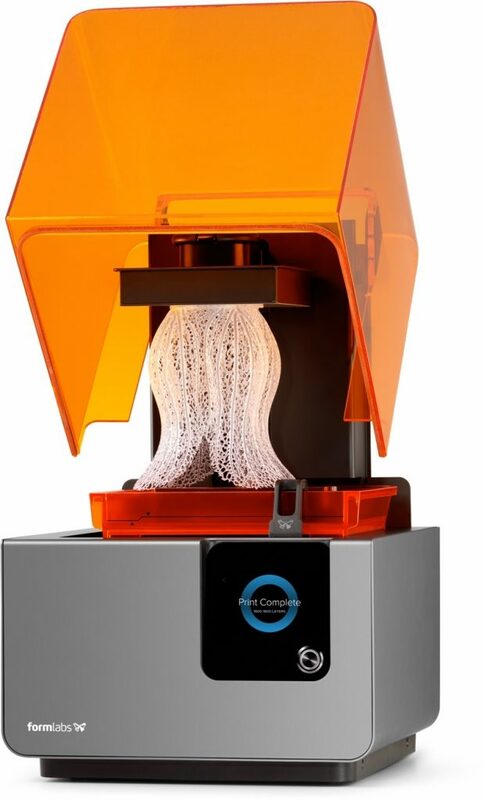 Photocentric’s recently unveiled LC Maximus 3D printer demonstrates this. Developed for ‘mass production and large-scale prototyping’, the machine uses a 4K 40” LCD screen and boasts a build volume of 700 x 893 x 510mm. With a price point of less than $15,000, the LC Maximus printer is highly competitive to comparable SLA and DLP systems. While Photocentric’s technology is still gaining traction, its accessibility and advantages over traditional SLA/DLP printing could make it a viable alternative to lower-cost SLA and DLP systems. The 3D printing resin market has become the largest segment within the AM materials market, with companies like 3D Systems and EnvisionTEC offering more than 25 proprietary resin materials. That said, material development for photopolymer 3D printing, that is, printable photosensitive resins, remains slow. One obstacle to greater material diversity is the proprietary nature of many resin materials. Cost, of course, is another. And the two go hand-in-hand. A proprietary materials model typically results in higher material prices and a slower pace of innovation for new material formulations. And yet, for the industry to continue to thrive, it’s important to have access to as diverse a range of materials as possible. One possible way forward is an open materials model. For some, in order for 3D printing to be viable for manufacturing, there need to be hundreds of engineering-grade materials available — an amount unlikely to be achieved by one company alone. Through strategic collaborations and partnerships, an open materials approach can facilitate faster material development, and accelerate the adoption of 3D printing on the factory floor. Origin is a company that has developed a programmable photopolymerisation technology (P3), to be launched in the coming months. Origin’s technology promises to go beyond standard photopolymers to offer new types of thermosets and a brand new chemistry. Key to this will be the company’s Open Additive Production platform, which will rely on partnerships to expand the choice of materials available to users of the technology. So far, Origin has already partnered with two large chemical companies, BASF and Henkel. Another new player embracing the open material approach is Fortify. Founded in 2016, Fortify has raised $2.5 million to bring its patented Fluxprint technology to market. The technology is said to be able to process high-performance composite materials. The company has established its Fortify Fiber Platform to welcome materials companies and resin suppliers to co-develop high-performance resins with Fortify’s team of material scientists and engineers. DSM, a specialist in photoactive resins for AM, has become one of the first Fortify Fiber Platform partners. So far, Fortify has developed carbon fibre and fibreglass-reinforced resins, which are reportedly the strongest resins available on the market. Ultimately, the open material approach could push the industry closer to additive mass manufacturing, opening up more applications at scale. SLA and DLP are forging ahead as mass manufacturing technologies. In one case study, DLP 3D printing completely replaced traditional manufacturing for hearing aids. Hearing aid manufacturer, Sonova, a market leader within the hearing aids market, has been using DLP technology to produce custom in-the-ear hearing aids since 2001. Today, the company 3D prints hundreds of thousands of unique pieces annually. Using the technology, Sonova manufactures the shells for in-the-ear hearing aids, which are tailored to suit the individual needs of each wearer. The company believes this level of customisation is possible only with 3D printing. Other industries can also see success with these 3D printing technologies, with footwear being a primary example. Vat polymerisation technologies offer a number of benefits for the footwear industry. For example, in 2018, sportswear brand, Adidas announced its mass production of Futurecraft 4D sneakers with 3D printed midsoles, made possible thanks to Carbon’s DLS technology. Made to withstand wear and tear, the sneakers’ midsoles are created from a liquid of polyurethane resin and feature a complex lattice structure in the heel and forefoot. This structure accounts for the different cushioning needs of the wearer while running, enabling higher performance and greater comfort. While these are just two examples of mass manufacturing with 3D printing, their implications are encouraging: far from being a tool solely for prototyping, SLA/DLP and 3D printing as a whole are capable of meeting complex manufacturing demands. When it comes to SLA, DLP and the wider family of vat polymerisation technologies, one of the key trends how applications of the technologies are increasingly moving towards manufacturing at scale. Driving this trend are important developments in the technology — faster, more accurate systems, a wider range of resin materials available and, of course, access to less expensive desktop alternatives. While the technology will continue to add value to already-established applications, the development of more automated, scalable systems will see these applications broaden even more. With new advancements being unveiled all the time, it’s certainly an exciting time to witness this evolution.